Make lovely birthday card with colorful balloon photo frame. 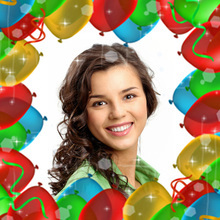 Adorn your birthday photos with party-colored balloons! Make a party greeting card with our balloon photo frame to congratulate your friends on birthday or other holiday.